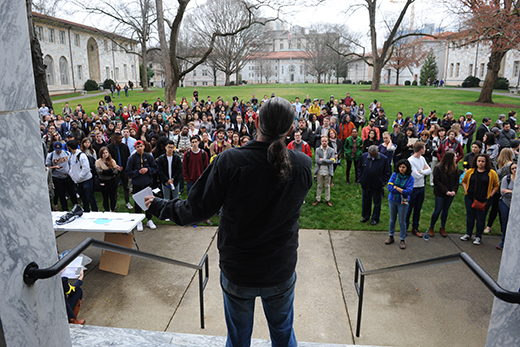 About 200 Emory students, faculty and alumni assembled on the Quadrangle during the formal inauguration of President Claire E. Sterk to continue the call for the president to designate Emory as a sanctuary campus. The Feb. 8 “Walkout Day for a Sanctuary Campus” was organized by the Emory Sanctuary Coalition, a campus advocacy group formed around the issue of access to education for undocumented students and those with DACA (Deferred Action for Childhood Arrivals) status. The event was organized and peaceful, with a series of speakers including faculty, students and activists from other organizations. Lynn Huffer, Samuel Candler Dobbs Professor of Women's, Gender and Sexuality Studies, framed the protest in the broader context of recent national events.